Every day, we come across the advice that happiness is in little things and in pleasures of life, but the real question is: do you really believe that? Do small things make us happy? or does it takes a lot more to be happy, preferably more money? The answer to this question is not easy, mainly because the question itself is incorrectly placed. When we say that something is small, we mean that it has a small worth, and vice versa; we believe that great things are worth a lot. The real question to ask is: what is it that we consider worthwhile?. The value system of each person is different and it would be wrong to say that each of us considers the same things as valuable and worthless, as large or as small. Do you want to understand how much something is important to you? We can measure its value in the same way that people have always measured it – by exchange. Would you give up health in order to have money? Would you give up a happy relationship in exchange for money? Would you let people humiliate you and consider you worthless in exchange for money? We can often hear around ourselves: “if I was a millionaire, I would …”. Whatever one puts as an extension, the ending is always the same – “it would make me happy.” In other words, anyone who says this means that money would fulfill a need or a desire, and that because of this he or she would become happy. There is a truth in this, because, really, a happy man is the one who has met all his needs. In the mid 20th century, psychologist Abraham Maslow proposed a theory that has a name after him – Maslow’s hierarchy of needs. This hierarchy is usually shown with the pyramidal model. 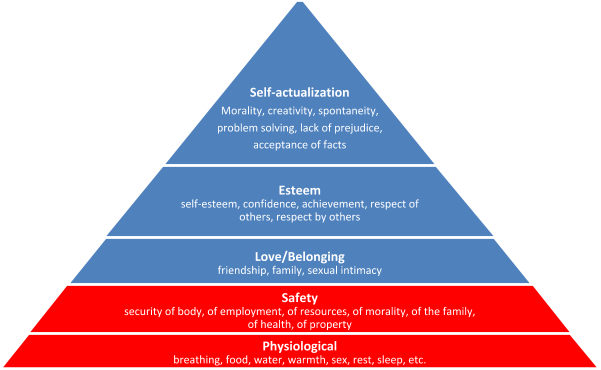 Maslow divided human needs into 5 types: physiological needs, safety needs, social belonging, esteem, and self-actualization. At the base of the pyramid there are the basic human needs; without them, the human life is not possible. These are food, drink, clothing, sleep and others. Only if these basic needs are fulfilled, then one goes up one level in the pyramid and feels the need for a safe house, security the family, peace, the absence of war, disease and anything that endangers human life and financial security. These needs are the basic needs without which a man is unable to take care of some higher needs, and we can say that this is a red zone, or the zone of survival. According to Maslow, the money is not even counted in these basic needs – it serves only as a medium to obtain them. However, in order to be really happy, it is necessary to fulfill higher needs, and for that, money becomes worthless.